Everybody is welcome, with children taken from four years of age upwards. 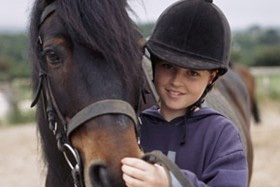 We have a wide range of horses and ponies to suit all ages and experience from quiet cobs to competition horses, all of which are well-schooled, quiet, safe and well cared for. All of the above activities will be supervised by qualified friendly and helpful staff. Tullagh Bay Equestrian Centreare A.I.R.E approved.